Glentoran have called on legendary manager Ronnie McFall to come out of retirement and reawaken the sleeping giant. The Glens brought Gary Haveron’s reign to an end yesterday and have now asked McFall to steady the ship until the end of the season. Oval chiefs felt they had to act after angry supporters staged a protest after the 2-1 defeat to Ards on Friday night and the door has now opened for McFall to return to the club he played for in the 1970s and managed between ‘79 and ‘84. 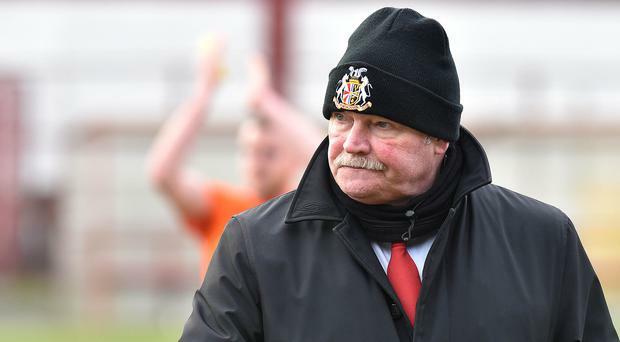 McFall was in charge of Portadown for a staggering 29 and a half years before his departure in March 2016, but he also led Glentoran to league and cup success, including a title-winning campaign in 1980-81 when The Oval outfit went undefeated. With Glentoran still in the Irish Cup and in the hunt for a top-six place and European qualification, a turbulent season could yet end on a positive note for the club, but the search is now under way for a new manager with Oval sources placing Dungannon Swifts boss Rodney McAree high on their wanted list. While McAree is on the Glens’ most wanted list, other names in the frame include Ards boss Colin Nixon, who was beaten to the post by Haveron, Warrenpoint Town boss Matthew Tipton and former Glentoran frontman Nacho Novo. Nixon was hurt when the club overlooked him and went for Haveron, and it appears highly unlikely the conditions will be right for him to accept the job now. In their statement issued yesterday, the club did not state Haveron was sacked, reflecting their appreciation for his devotion to the job. The Glens statement read: “Glentoran FC wishes to announce that team manager Gary Haveron has left the club. Since his appointment, Gary has shown unrelenting enthusiasm and commitment to the role and to securing a positive future for Glentoran. “His work rate never wavered and he has been an outstanding ambassador for the club. We thank him for this and wish Gary every success for the future both inside and outside football. “However, the board of directors reluctantly reached the conclusion that despite strong backing for Gary’s rebuilding plans in both the summer and January transfer windows, results and performances in recent months have shown little or no improvement on the same period last season.